Want a quick hit of inspiration? God, help me to bring your love to everyone I meet today. Let all that I think, speak, and do be rooted in the eternal love that comes only from you. Remember we are called to love others, even when we don’t “like” them. Make a mental list of people you have trouble loving. Add their intentions to your prayer list for this month. 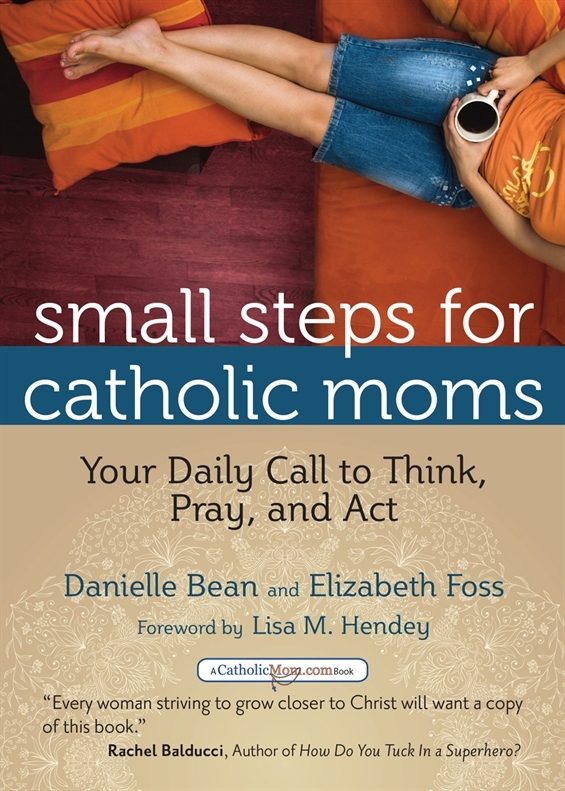 If you liked what you read above, Small Steps for Catholic Moms by Danielle Bean and Elizabeth Foss is the book for you. 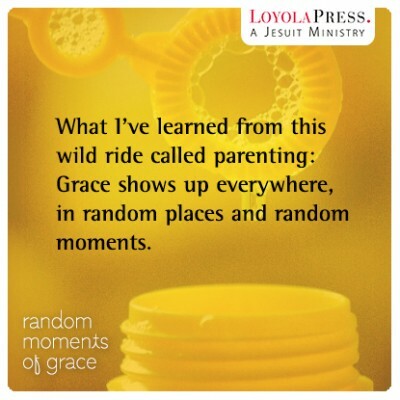 First of all, you have to love the concept: it’s a mom-centered daily devotional where every day offers you an inspiring quotation, a short prayer, and a related action. As you see in the excerpt above, it takes about a minute to read the entry, meaning this is one book that moms actually have a prayer of finishing. Sometimes — as they say — less is more. In fact, ever since the kind folks at Ave Maria Press sent me a copy, I’ve been reading each entry over my morning coffee. And yes, it does make my day better. The mere fact of having a specific action in mind for the day makes me more intentional about how I interact with others. It makes me more aware of the little opportunities for love and kindness and charity and grace that exist in the course of a mom’s day — even a day where I feel like I barely have time to catch my breath. I like books like that. And guess what? I’m going to share the love! Thanks to Ave Maria, I have a copy to give away, too. To enter, all you need to do is leave a comment below. Entries will be open through next Sunday, October 13th. 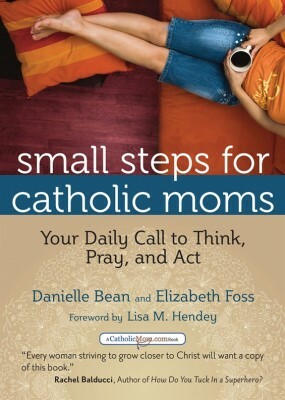 (Oh, and if you like contests and winning cool books, you won’t want to miss the CatholicMom.com Five Minutes Alone contest.) But don’t forget to leave a comment here first! Today I’m delighted to be Stop One on the blog tour for Rock-Bottom Blessings! Thanks to Loyola Press for the review copy. Unsurprisingly, I find that it’s easiest to believe in an abundant God when everything in life is going well. Like most of us, any hitch in the proceedings of my life — illness, pregnancy loss, dashed hopes, etc. — leads me to wonder if God has perhaps slipped out for a little coffee break and is absorbed in playing games on his phone while I flounder alone. This is why Karen Beattie’s book Rock-Bottom Blessings strikes such a chord. How to describe this book? Well, on the one hand, it’s a spiritual memoir of loss. In honest and straightforward (and at times, wryly humorous) prose, Beattie shares those moments in her life when things just weren’t going so well. 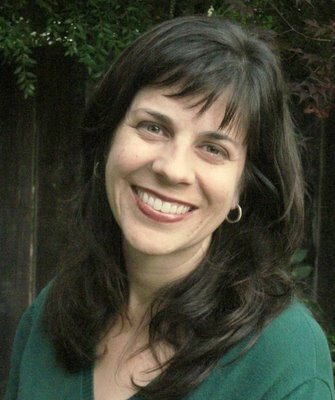 She talks about job loss and the resulting financial difficulties, about the pain of miscarriage and infertility, about the death of her mother, and about the almost insurmountable difficulties she and her husband faced in their efforts to adopt. 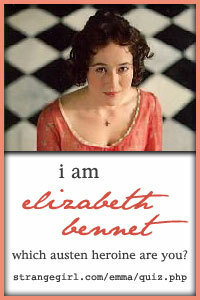 In other words, she writes about life — life at its most unsettling and challenging. But the story doesn’t end there. Woven throughout the book is Beattie’s growing and gradual awareness that these rock-bottom moments are actually a great opportunity for growth. As she takes the reader along on her journey through disappointment and loss, she shares the spiritual insights she’s picked up along the way. Supporting her husband during the hard times is the catalyst for her to understand the sacrament of marriage more deeply. The challenges on her path to parenthood give her a new understanding of Mary’s trust in God (which, having grown up Baptist, is a big change for Beattie, who was raised with the sense that Mary is “just a character in the Christmas story who appears around Christmastime and then goes away the rest of the year.”) The apparent lack of blessings in her life challenges her to see the blessings that are already there, even if they are not the ones she’d have chosen for herself. All of this makes her story so accessible, honest, and resonant. Can’t we all relate to the experience of thwarted plans, and — hopefully — to the perspective we can gain from them, if we remain open to it? One chapter that spoke to me the most was Beattie’s frank admission of how she struggled not to be jealous of those who were getting what she herself wanted. She cites the example of a Facebook friend who announced that she was adopting a child, just when the Beatties’ own adoption process seemed to have hit an impasse. Reading the chapter, I was awash in memories of my own struggles to have a family. My first two pregnancies ended in loss, and for a time, it was doubtful I’d ever be able to carry a baby to term. During that time, every announcement of a friend’s pregnancy seemed like firm pressure on a very raw wound. It was a very very difficult place to be (similar, in fact, to the way I felt in my twenties, when everyone around me was getting married and I was still single). I hated for feeling so jealous and petty … but I did. That’s why I love how Beattie was so honest with her struggles, and how she knew that her envy was “rotting her bones ” (a great allusion to Proverbs 14:30). “Life was like a competition, and I was forever sizing up my opponents,” she writes. Gradually, she learns that the key to overcoming these feelings is to force herself to move toward the lucky person, not away. “I wanted to tear down the wall of envy brick by brick, to love others, to store up treasures in heaven,” she writes. Reading this chapter, I felt so affirmed … not only in the fact that others struggle too, but also in the fact that these struggles can, with diligence and effort, be tamed. I don’t want to give spoilers here, but I will add that the book ends happily, with a blessing that made me get a little misty. But in a way, the most important takeaway lesson from the book is the idea that life isn’t just one period of storms and then a blissful forever-calm. Learning to navigate loss is a skill that we will keep using time after time, because that’s life. And, having read Rock-Bottom Blessings, I feel that I will be able to do it more intentionally, graced by the lessons that another woman was honest enough to share. 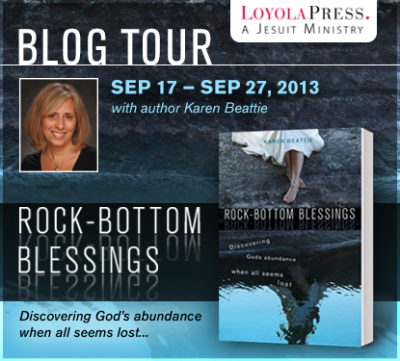 Rock-Bottom Blessings is available on the Loyola Press website, Barnes and Noble.com, and Amazon.com. Count Phil Fox Rose as one of the many fascinating people I’ve gotten to know through my writing. He edited one of my articles a while back (in my eight-plus years of writing for publication, it happens to be one of the articles closest to my heart), and we connected over a shared love of books. Phil has one of the most intriguing faith stories I’ve ever heard, and he also has a great blog at Patheos, which is where we are today for the very last stop on the blog tour. His blog is all about spiritual journeys, so it’s the perfect place to wrap up our travels. It’s been a fun ten days on the road. Thanks for walking some (or all) of the way with me. I hope you’ve had a chance to check out a few new blogs, or maybe revisit some old favorites. Next week I’ll be settled back into the normal blogging routine … but, as always happens when we travel, life will be all the sweeter for the places I’ve been and the people I’ve met. Today for Blog Tour Stop the Ninth, we’re visiting Create With Joy. This is a great site dedicated to creativity in all its forms: you’ll find book reviews, craft ideas, and recipes galore (including this one for Watermelon Sherbet Smoothies … yum). You’re guaranteed to find something that gets your creative juices flowing. You’ll also find a review of Random MOMents of Grace, an excerpt, and a chance to win your own copy! And tomorrow? 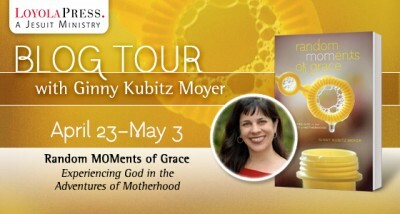 Well, it’ll be our last leg on the tour, and we’ll be visiting a blogger with a fascinating faith journey of his own. See you then! It’s May Day! This is the month in which Catholics traditionally honor Mary (who, as you probably already know, is one of my favorite moms). 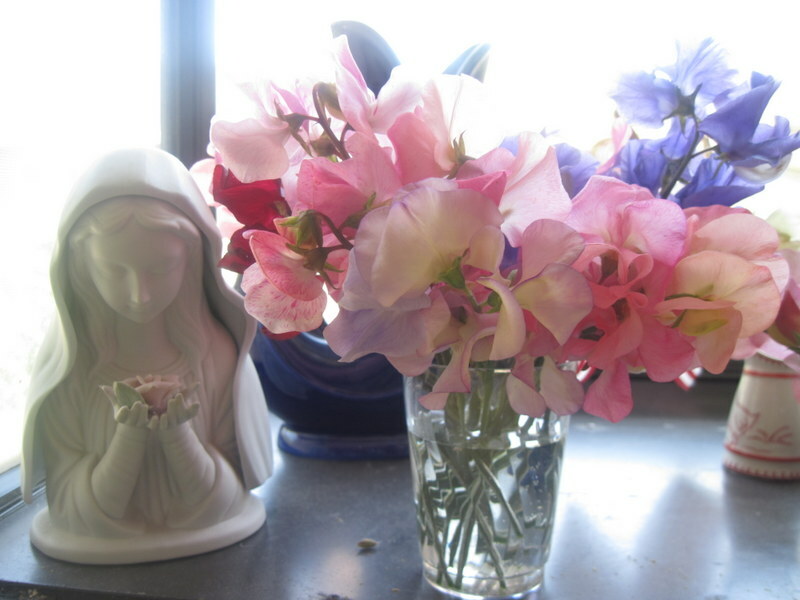 Here she is in my kitchen window, with the sweet peas that my neighbor so kindly left on my front step. Mary + flowers always gives me a lift. This is the perfect day to head to Of Sound Mind and Spirit for Blog Tour Stop #8. Lisa and Shelly are sisters (a blog Sister Act! I love it!) and they have graciously rolled out the welcome mat for Random MOMents of Grace. Thanks for the hospitality, ladies — I wish I could leave some sweet peas on your front steps. And no, we’re not done touring! See you here tomorrow for our second-to-last stop.